The report “Growing Australia’s FLNG supply chain: Potential opportunities for the Australian supply chain to participate in servicing the needs of floating LNG facilities” which I produced for the University of Western Australia and The Australian Petroleum Production and Exploration Association (APPEA) was released on Thursday 11th May 2017. 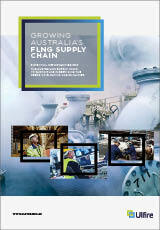 The report looks at the life cycle of a major resources facility (in this instance a FLNG facility) to identify how and where Australian organisations can access the supply chain and what they need to be aware of to do so. While the report specifically considers opportunities associated with an FLNG, many of the findings and recommendations are common across the LNG and other energy resources industries. This report is accompanied by work undertaken for the same clients by Deloitte Access Economics, who looked at the economic impact of FLNG on the Australian economy and an overview of the two reports produced by UWA. The report proposes a number of recommendations for all parties involved in such a facility, including the operators, the suppliers, government and those involved in the design of facilities like this to find ways to improve the strength of the local industry that will be needed to support these facilities into the future. The supply chain report can be downloaded from the button links below (both links are to the same document). 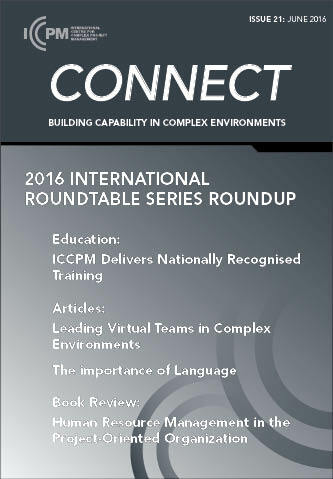 I am delighted to say that I have had an article published in ICCPM Connect, the quarterly journal of the International Centre for Complex Project Management. In the article I discuss some of the attributes and skills needed to successfully lead a virtual team in a large and complex project environment. The rapid growth in the use of distributed or virtual teams to execute engineering projects, ranging from relatively modest buildings and infrastructure through to multi-billion dollar resources mega-projects, has introduced entirely new layers and areas of complexity to the control and execution of the projects. These new challenges are generally poorly understood by the organizations undertaking the work and consequently tend to be managed on the run rather than designed out in the planning phases of their projects. Unanticipated problems during the execution of the projects often result in lost productivity and distraction of the project management team. This often occurs at critical phases, along with lost opportunities for the organizations to be able to take on additional projects as they deal with problems and delays. Many project delivery organizations, laboring under the procedures and processes developed over many decades to control and manage co-located projects, struggle to adapt to the requirements of the new organizational structures they have to have in place for the distributed teams of modern projects. They often find that traditional approaches leave them exposed to previously unforeseen execution risks. Additionally, new boundaries and battery limits introduced by the adoption of distributed execution methodologies has brought with them interpersonal interfaces that are completely new to many engineers, and which are rarely considered in the training of staff. These interfaces, both technical and human, if not properly considered and controlled can lead to communication breakdowns with resulting loss of productivity, errors and rework, putting the projects at greater risk. 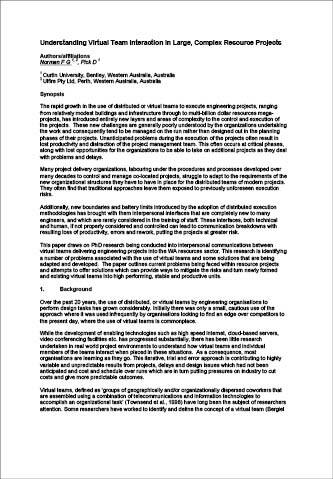 This paper draws on PhD research being conducted into interpersonal communications between virtual teams delivering engineering projects into the WA resources sector. This research is identifying a number of problems associated with the use of virtual teams and some solutions that are being adapted and developed. 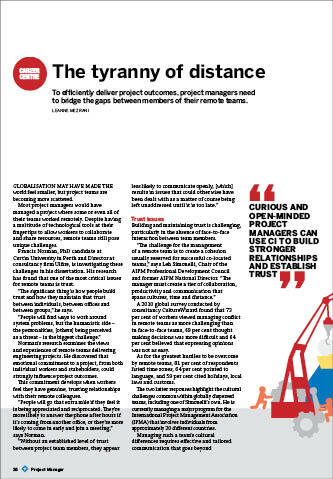 The paper outlines current problems being faced within resource projects and attempts to offer solutions which can provide ways to mitigate the risks and turn newly formed and existing virtual teams into high performing, stable and productive units. 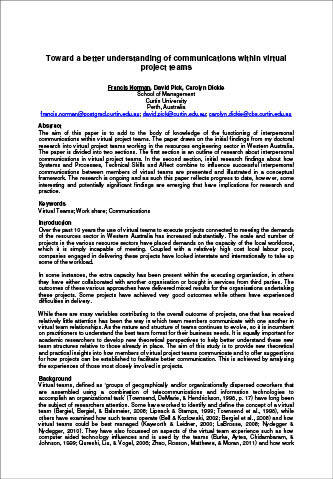 The aim of this paper is to enhance theoretical and practical understanding about interpersonal communication within virtual project teams. The paper draws on the initial findings from research into virtual project teams working in the Western Australian resources engineering sector. The paper is divided into two sections. 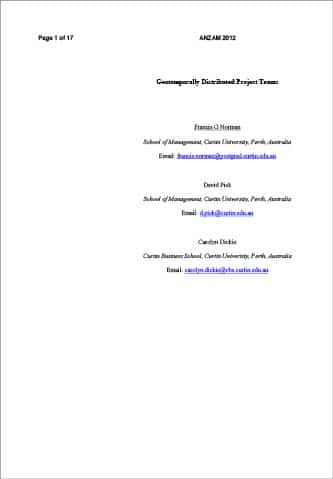 We first outline existing research about interpersonal communications in virtual project teams. In the second section, research findings about how systems and processes, technical skills and affect combine to influence successful interpersonal communications between members of virtual teams are presented and illustrated in a conceptual framework. The research is ongoing and as such this paper reflects progress to date, however, some interesting and potentially significant findings have already emerged that have implications for research and practice. The aim of this paper is to enable a better understanding of interpersonal communications within virtual teams whose members are separated by long distances and/or time zones. To this end, the ideas of temporal diversity and temporal dissonance are combined to develop the concept of geotemporally distributed project teams. This complements existing theory by providing a way of understanding project teams, formed temporarily to perform a specific task, whose members are separated by time and/or distance, and communicate using computer mediated technology. This definition is expanded into a theoretical framework that opens up new lines of inquiry that has the potential to produce new perspectives on theory and practice in the areas of virtual work and group processes.